The team were lucky to catch up with Simon Beck before his solo concert this weekend at Rugby Theatre to find out more about his passion for music, theatre and of course his local links to Rugby. For those who have followed Simon’s career to date, you would know him for his talent, enthusiasm, and for being an integral part of the theatre scene in the UK, Europe and has performed as both conductor and performer on stage. Simon made his conducting début at the age of 20 conducting the German premier production of Andrew Lloyd Webber’s ‘Sunset Boulevard’, also recording alongside an all-male ensemble vocals for demo album of new musical, ‘Company Man’, composed by Barney Milner. One night only on Sunday 26th October was the 20th anniversary ‘homecoming’ concert held at Rugby Theatre. The performance was to be a showcase for Simon to take the audience by the hand and lead them on a journey through his own professional musical career. With the stage set for a medley of performance ahead, we were taken on a musical journey of theatre classics, presented with style, direction, humour and entertainment. The auditorium was packed to the rafters with an audience poised to witness the creative direction of Simon Beck, alongside special guests Justine Balmer and Kim Ismay, including a 7 piece band of London’s finest musicians and his backing singers ‘The Awesome Foursome’. The concert from start to finish was to become a synergy of musical talent, sharing a passion for theatre and performance. 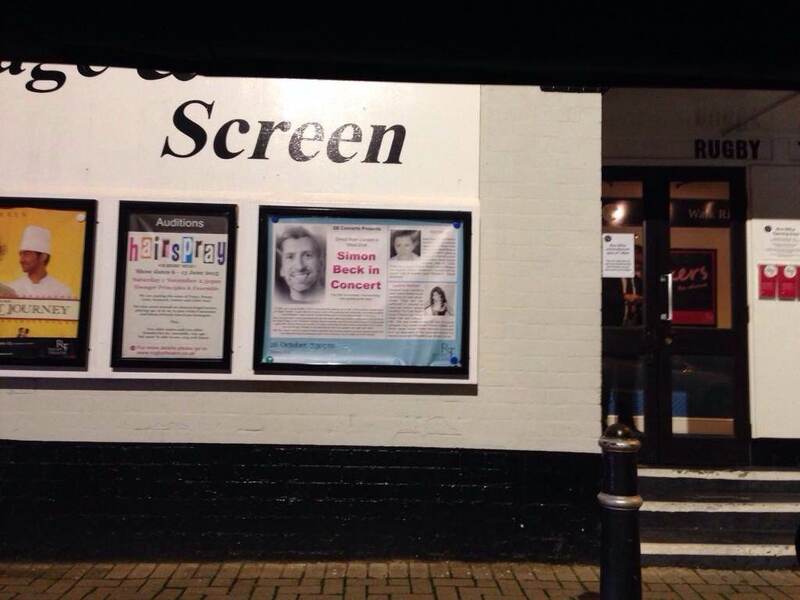 In 1994, Simon performed the leading role of ‘MC’ in the musical ‘Cabaret’ at Rugby Theatre, as a young amateur. A year later he became a part of the professional community, conducting Andrew Lloyd Webber’s mega musical, ‘Sunset Blvd’, in its European premier in Germany. Now, 20 years later, he returns to the area, having performed all over the world with many leading artists from Victoria Wood, via Elaine Paige, to the ‘Phantom’ himself, Ramin Karimloo, and hot from performing to 15,000 people nightly with Monty Python at London’s O2 arena. 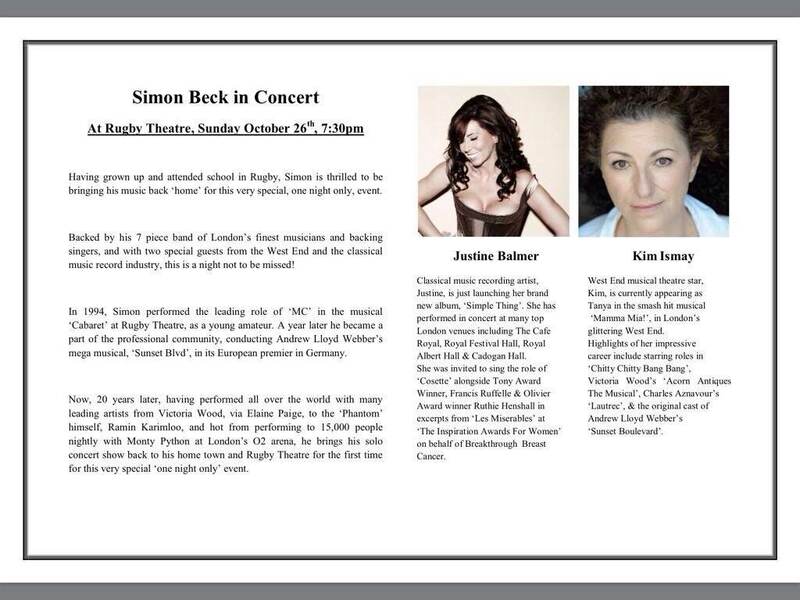 The only ask is that ‘One Night Only’ become the first of many for Simon Beck and his solo concert career. Simon has a wealth of musical accolades, including; Award winning Musical Supervisor/Conductor of West End and major touring theatrical productions and pre-eminent concert/cabaret Musical Director for London and New York stars such as Olivier Award winners Janie Dee, Clive Rowe and David Bedella, Stephanie J Block, Ramin Karimloo, and Scott Alan. Justine has crafted stage presence and camera technique under the spotlight of QVC and stepped out in front of an orchestra night after night singing classics, musical theatre, opera, rock and pop. Justine has headlined on the QE2, Royal Caribbean, Azamara, Regent and Seabourn cruises and her journey has led to her being invited to perform at many top London venues including the Cafe Royal, Dorchester Hotel, Royal Festival Hall, Royal Albert Hall and Cadogan Hall; plus various concert halls and theatres across the UK. Kim has a wide variety of credits to her name, as an accomplished actor, singer and dancer. She is equally at home with serious and comedy roles, and has a natural talent for mimicry and dialects. Kim has performed in several long-running theatre productions, as well as one-night galas and cabarets. In addition to her theatre work, Kim has appeared on television, radio, video and DVD, and enjoys doing both live and recorded performances.